On the basic level this is the story of Jed Martin’s artistic phases, his romances, his successes and failures, and his relationship with his father. This thread persists to the end of the book, even though part 3 strays and becomes its own self-standing mystery story. Houellebecq cleverly includes himself as a character, a bit part at first and later more active and prominent. He is hired by Jed Martin to write a descriptive chronology of his works. This device gives the author an added dimension to his ability to present all things Martin. And many things Houellebecq (the writer’s home, his habits, his diet, and eventually the stench of his own murdered body). My favorite thing in the novel (which has some eye-opening sections about art and the gallery business and a particularly terrific set of discussions about William Morris and the Pre-Raphaelites) is the interaction between Jed and his father. Houellebecq can be hard-shelled, sometimes aloof, but he got the son and dying father part down pat. My least favorite thing (and this is at the ‘Picky’ measure line in the jigger) is the principle character’s name. Jed Martin sounds like a hillbilly name, and even if younger readers who never watched Paw and Granny don’t get that, well, how about the fact that Jed sounds too much like Jeb. Other items of note: the women interests, Genivieve and Olga, are no mere stick figures but instead real and memorable. The more involved and/or subtle descriptions of France and the French way of life are likely best appreciated by those who know France, and since I don’t, I skated through much of that stuff. Jed’s agents and curator characters were more auxiliary than alive, and in keeping with the allegorical patterns in the novel, that fits. It’s the art and the work which are real and of the heart, while the presentations and sales are secondary. Finally, another interesting twist is that Jed Martin is the antithesis of the financially failed artist we’re usually stuck with in stories. Everything he produces turns to gold; he becomes immensely wealthy and in high demand. His shorter and more mundane novel “Whatever” remains my favorite. That one portrays a bourgeois world of business writers and software folks that I can identify with more readily. 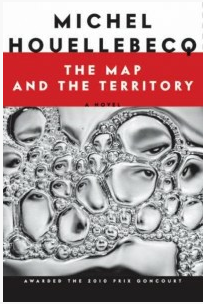 “Map and Territory” is on a far grander scale, dealing in a world of wealth and endeavors far beyond the sphere of us ordinary grubs. It is nevertheless a very good novel and not a pretentious one. It took me a while to read it because each paragraph has weight. Some parts were dead-on witty and perceptive. The book has a more complicated allegorical level, which is worth further contemplation. One day. Posted in booknotes on June 12, 2012 by Wm P.